There is no single, linear method of going from complete novice to developing a framing business. It is always a mixture of what skills you already have, what you have started to do for yourself, making good choices and taking opportunities as they arise. Rob McRae trades under the business name of Beaver Products, which is fundamentally a framing gallery / workshop. But as with many of us, the framing bug started at a simpler, more personal level. Rob had worked in a number of different roles, many years being spent in the paper manufacturing industry: however he had always had an interest in art and had always framed his own paintings. Because of this artistic bent (and some years’ experience), framing comes quite naturally to Rob and not only ties in with, but forms part of, his very lifestyle. At a personal level Rob is happy with the quality of his painting, and still likes to keep his hand in, but he is aware that it being commercially viable is another matter. Nevertheless having pursued painting as a hobby, by 2000 he was beginning to frame other people’s art as part of those interests. Then, at around the same time, he began looking to change careers and eventually set up a small framing shop in the basement of his home near Otley, Leeds. Working from a residential setting was limiting: developing a wider customer base is harder; delivery access more problematic etc. In the end Rob decided to look for better premises, with more space, eventually discovering a small framing business for sale in Pudsey, which he took over in the Christmas of 2013. Situated on the high street, with roadside parking and within easy walking distance from the town outskirts, it is perfectly situated. Also, now living over the shop, he can work late or choose his own hours around shop opening times. artists have done quite well on a commission basis. The ground floor of the building is split into two work areas. You enter the shop into the main workshop area, where all of the planning and frame making (Morso & manual underpinner) takes place, along with an area for staining and waxing bare wood mouldings, so the customer has a first hand experience of these processes. In the rear there’s a 52” laminator & cold press. An additional basement workshop features a second Morso, crosscut and bench saws, and paint sprayshop. Storage space is limited, so apart from a few stock items, Rob tends to order materials as needed. 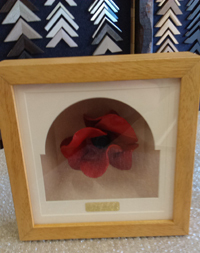 As part of the framing process they are often asked to incorporate small brass plaques, particularly with sports memorabilia etc. As a result they have invested in an engraving machine and also offer a pet tag and trinket engraving service! Rob also has access to Photoshop and has enhanced one or two customer photos in the past, but he foresees more planning and organising before this can be launched as an additional, offered service. 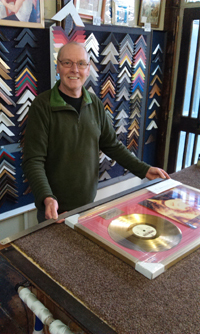 When he took the business on, it was already a picture framing service, albeit somewhat run down as the previous owner was retiring, and only opened a few days a week. Nevertheless there was a good customer base and, fortunately, Rob didn’t need to put a lot of additional resources into advertising. Currently there is no website, as such, however Beaver Products can be found on Google and social media. A big bonus with the business being already established prior to Rob’s takeover, there were orders already on the books so no need for a launch as such, just business as usual. It is a relatively small concern and had previously been a one man operation; however since taking it on, Rob has built the business and expanded the customer base to the extent where he has had to take on a full time assistant. This, in turn, has relieved some of the pressure and freed up more time for him to concentrate on the bits he enjoys most: so business is great and life is wonderful! However he’ll not forget that first bit of “commercial” framing. For people starting out in the framing business Rob has three main points of advice. Proper planning: decide what the end result should be, and plan meticulously how you will achieve that, stage by stage before you cut so much as an inch of frame. Once you do start work the quality is imperative: if something is wrong, no matter how trivial, do it again, do not fall into the trap of “oh it’ll do”. Enjoy creating your products: do them to the best of your ability and your customers will enjoy them too!